Click images below for detailed instructions. One of my favorite places to relax is outside somewhere in beautiful nature. 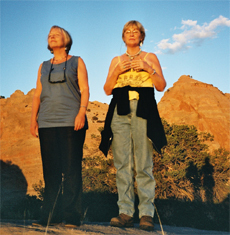 Here I am absorbing the energy of Georgia O'Keeffe, who just happens to be my second cousin (very proud of that), not far from where she lived outside of Santa Fe. This is just one shot of Ghost Ranch. What a great place to be! 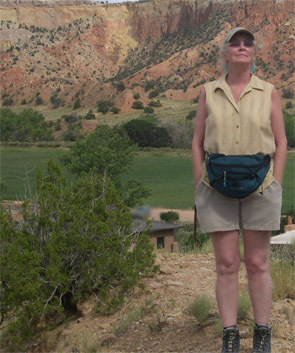 My friend, Juana Cruz, took this picture while we hiked up the trail in August, 2007. Note: If you have already purchased YogaNata or the YogaNidra CD that is for sale on this site, this Relaxation series is the instruction manual that provides all the details to successfully practice The Complete Yoga Relaxation with either product. Study these pages. The instructions on the CD insert are summarized. In this series, they are comprehensive. The art of complete relaxation—to get the feeling that you are light and floating—is something we all should have learned from childhood while in school. Unfortunately, we didn't. It doesn't make any sense why memorizing the presidents from so long ago is more important than knowing how to be focused and relaxed. A child today knows names and dates that have no significance in their life when they become an adult, yet they haven't got a clue about how their own body functions or how their mind works. I would suggest that we each visualize the earth as it appears in the image above, and begin to realize that what we do here, now, is what counts. Everyone should know how to relax for their own well-being. Believe it or not, a vacation retreat is not as effective as the retreat you could create within yourself without ever having to go anywhere. It is not as difficult you might think. Imagine being in one of the most incredible nature spots in America and stopping to take it all in, as Mette (left) and I (right) did here in Palo Duro Canyon, Texas. Imagination is a good way to learn how to relax, and it makes it so much easier if you have something to focus on until your body responds. Or ... they practice Yoga Relaxation—the most efficient method that I've seen in my stress-relief workshops at major corporations and Yoga classes taught to thousands of people for more than three decades. It always works. Everyone gets more relaxed than they have ever been. It's a wonderful experience. You can learn how to relax your entire body and mind at home, right here, with me. Yoga-Nidra is an ancient form of relaxation. This kitten knows it naturally and will never forget it the way we did. Just think about how babies sleep through the most incredible noise, undisturbed. That is complete relaxation, complete surrender to the body's needs. We need to get back to our natural state of awareness. In my DVD/book, YogaNata, I take you through every muscle in your body in a 30-minute deep relaxation (the link to purchase it is provided on every page of this site, upper left or in the Products section). Once you have learned how to fully relax your body, you will feel the difference in your daily life. Someone who knows how to relax is always more graceful than someone who is stressed. To awaken every morning feeling refreshed, practice Yoga-Nidra every night when you go to bed. With practice, you will be able to find every muscle in your body without any trouble at all. This also means whenever you want to, you can relax any part of your body at will. In YogaNata, the 30-minute relaxation is done after a 15-minute Yoga dance and a 10-minute Complete Yoga Breath exercise. But this relaxation can be done after any form of exercise, or just to eliminate the stress of the day when you get home. My clients tell me how much they enjoy listening to the relaxation when they need to stop thinking about work and family stress. They say it makes their life feel more balanced. It makes it easier to deal with whatever piles up during the day that is negative. The mind and body are normally capable of handling stress without adverse effects. Your nervous, endocrine and immune systems, and blood cells all function together to continually re-balance your internal environment to keep you healthy. When these systems are not functioning well enough, or in a coordinated manner, then stress becomes distress. This is when your body becomes unable to resolve imbalances that occur as a result of foreign proteins, microorganisms, emotional and mental states, and physical challenges. For an external challenge to become a problem, there has to be something on the inside that no longer maintains your state of well-being. Yoga is one of the best tools to convert inner imbalance and distress into balance and normal stress. To deal with too much stress and learn how to relax, one needs to first ask some questions. How do you allow stress into your life in the first place? How does that stress change your patterns structure? Do you maintain good posture? Do you continue to eat foods that are non-toxic and nourishing? Do you rely upon stress-reducing habits that are injurious to your system—smoking, drinking alcohol, taking drugs? Do you allow your emotional relationships—which are an important support system during times of stress—to be damaged by negative behaviors, such as anger, or blame? All of this contributes to stress. Too much of any of this leads to distress. Stress can over-excite the nervous system, which coordinates and controls your entire body balance. A nervous system which is hyper- or hypo-functioning will result in back pain, imbalances in muscle tone, digestive function, heart irregularities, imbalances in sugar metabolism, endocrine imbalances resulting in exhausted adrenals, changes in sexual function, thyroid and metabolic imbalances, liver dysfunction, skin problems, loss of hair, difficulty in breathing, anxiety attacks, asthma-type symptoms, and a whole host of other ailments. It is also a known fact that preoccupation with stressful problems can result in a loss of present-time focus, which can cause accidents, injuries, and disabilities. It is for all of the above reasons that Yoga is an indispensable solution to achieve stress-relief. And it is inexpensive! Learn how to relax your entire body and mind with the next click. Again, if you already have the Relaxation from the DVD or CD, which is for sale on this site, please study the following pages to fully understand how to reach the goal you desire. If you came to this page from Postures, you can return to that series here.